With lethal shells and rockets surfacing in large numbers even in states far away from some of the “original areas” of Western Uttar Pradesh, the authorities have now launched an extensive exercise to trace and identify steel mills that may have received consignments of metal scrap imported from the war ravaged countries of West Asia prior to the devastating blast. The Congress today favoured an Ireland-type peace agreement for resolving the Kashmir issue even as it questioned Pakistan’s “interest” in the state. Addressing a conference of the South Asia Free Media Association here, party leader and former Minister of State for External Affairs Salman Khurshid said there were several contemporary models of successful reconciliation and transformations, leading from hostility to peace, such as in South Africa, Berlin, Vietnam, Palestine. Bringing about a consensus for a “model nikahnama”, clearly stating the basic terms of the marriage contract, including the “mehr” amount fixed between the bride and the groom, is a task the All-India Muslim Personal Law Board has set for itself for its general body meeting in Kozikode later this year. The Congress may be all set to form the next government in Arunachal Pradesh, but the election results hardly augur well for the party. Arguments on charges framed against Maj Surinder Singh, facing General Court Martial for reporting fake enemy killings in Siachen, were completed in a military court here today. Doctors involved in kidney racket? A self-taught artist, who explores the soothing power of nature. That is Surjit Singh Barnala, Governor of Andhra Pradesh, whose exhibition of paintings is being held at the State Gallery of Fine Arts in Hyderabad from October 1 to 15. He had no formal training in art, but Barnala had the urge to paint even as a child living in adversity. 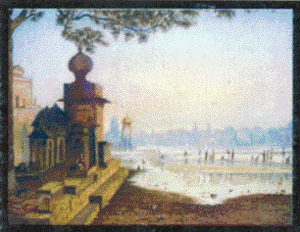 ‘Godavari at Nasik,’ done in Chandigarh (Burail) jail, 1984. Congress chief Sonia Gandhi was the target of a joint rally addressed by Shiv Sena chief Bal Thackeray and former Prime Minister Atal Bihari Vajpayee. Both leaders, who had stayed away from the campaign due to ill health, were addressing for the first time on the penultimate day of campaigning. Bal Thackeray campaigns ahead of crucial polls in Maharashtra. India has called upon the developed countries to protect the interests of small and marginal farmers in the WTO while negotiating on agriculture. Inaugurating the sixth meeting of the Asian Farmers Group for Cooperations (AFGC) here, the Minster of State for Agriculture, Food and Civil Supplies, Mr Kanti Lal Bhuria, said the interest of developing countries must not be sacrificed at the WTO negotiations. The Centre has released Rs 10 crore for 24 roads to be constructed in Amethi, ahead of Congress leader Rahul Gandhi’s four-day visit to his Lok Sabha constituency beginning tomorrow. Sources in the state security apparatus said Mr Gandhi would reach here tomorrow morning and leave for Amethi where he would stay for four days. The Bhopal Gas affected people have received some consolation. Supreme Court has accepted their long-standing plea to oversee through its own agencies medical facilities provided to them in the hospitals-specially set up to cater to their requirements. Once Harivanshrai Bachchan wrote: “Jab shayar budha hota hai, uski kavita tab naujavan ho jati hai’’. According to sources a special team of police and intelligence personnel was scrutinising the records kept at the ports of entry, particularly Kandla in Gujarat and at the various Inland Container Depots to ascertain the destination of the metal scrap consignments containing lethal live rockets and missiles. The decision to track down the metal scrap consignments was taken to prevent recurrence of an accident like the one in a Shahibabad (Ghaziabad district) steel factory on September 30. As many as 10 persons had lost their lives in the mishap. Senior officials said while most of the scrap containers at the Inland Container Depots had been segregated for thorough inspection by explosive experts after the factory blast, they were not certain as to how many such containers had already reached their destinations. The officials admitted that the task was a tedious and time consuming one but it was extremely important to prevent further loss of lives and property. “It is essential that all such material be sifted to prevent accidents”, a senior officer monitoring the investigations said. These officials said the help of the industrial associations in various states, where steel mills and factories were located, was also being sought to help trace the consignments of scrap that may have escaped initial scrutiny at the ports of entry and at the Inland Container Depots. Another reason for launching such an exhaustive exercise was the fact that the investigators were a little sceptical of the initial searches and clearances granted to these consignments. Explosive experts from the Army and the National Security Guard (NSG) who are helping in defusing rockets and shells in the scrap have been overwhelmed by the sheer numbers of these. Even though many of the rockets and shells require sophisticated launchers to trigger them off, experts said these could also explode due to the heat of the smelters causing extensive damage. The Congress today favoured an Ireland-type peace agreement for resolving the Kashmir issue even as it questioned Pakistan’s “interest” in the state. Addressing a conference of the South Asia Free Media Association (SAFMA) here, party leader and former Minister of State for External Affairs Salman Khurshid said there were several contemporary models of successful reconciliation and transformations, leading from hostility to peace, such as in South Africa, Berlin, Vietnam, Palestine. “One can pick out interesting pointers from each one of those. However, the most rewarding exercise would be to examine the Irish peace agreement,” he said. On its part, the BJP favoured the formation of a South-Asian union with softer borders among the region’s countries even as it backed the UPA government in the ongoing peace process with Pakistan despite differences on “some aspects”. Senior BJP leader and former External Affairs Minister Yashwant Sinha said India being bigger among the South-Asian countries would be ready to make concessions in the field of trade and commerce. SAFMA secretary general and senior Pakistani journalist Imtiaz Alam, describing the militancy in Jammu and Kashmir as “civilian insurgency”, said the dominant opinion in the valley was for achieving “azadi”. While no draft of the nikahnama is available, the need for it has been underlined and suggestions from members have been invited, announced Mr Abdul Rahim Qureishi, Assistant General Secretary and spokesperson for the board, yesterday. The board had an informal meeting of its office-bearers on the Nadwa campus, which was described as “a routine meeting for stocktaking”. Chairman Maulana Rabey Hasan Nadvi, Vice-President Kalbe Sadiq and other senior office-bearers were present. The nikahnama will have guidelines and declarations from both the parties. It would also be signed by the witnesses and the “vakil”. Mr Qureishi ruled out the possibility of granting women the right to divorce in the nikahnama. The other item on the agenda was to get inheritance rights for Muslim women in agricultural land. The Congress may be all set to form the next government in Arunachal Pradesh, but the election results hardly augur well for the party. The victory of 14 Independent candidates, mostly Congress rebels, who could play a crucial role in government formation in the north-eastern state, may also be a pointer to the post-poll scenario in Maharashtra. It has not exactly been a clean sweep for the Congress in Arunachal Pradesh though its leaders had informally maintained that this would be a one-sided election. As in the case of Arunachal Pradesh, the Congress is facing a threat not so much from the opposition combine in Maharashtra, but from the large number of its own rebel candidates. Although the Congress and its ally, the Nationalist Congress Party (NCP), took firm steps to quell all rebellion among their cadres, the problem remained unresolved. Reports from Maharashtra point to the large presence of rebel Congress and NCP candidates in the fray, who are all out to queer the pitch for the ruling combine. Having been denied the ticket by their parties, these candidates are either contesting the polls as independents or have been given the ticket by the Samajwadi Party or the Bahujan Samaj Party (BSP). 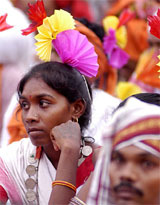 It is estimated that at least 100 rebel candidates are contesting the assembly elections in Maharashtra. Although most opinion polls have said the Congress-NCP combine enjoys an edge in Maharashtra, the leaders of the two parties are well aware that the presence of rebel candidates could prove to be a problem in the post-poll scenario. This would be particularly so in the case of a hung assembly, as predicted by one opinion poll. If Arunachal Pradesh proves to be a precursor of things to come, the Congress has reasons to worry. The 14 independent winners in the state have emerged as the second largest group in the 60-member assembly. The full results are yet to come in and their numbers could go up further. It is possible that the Congress, which has already bagged 24 seats, may be able to form the government on its own but the presence of such a large number of “rebel” candidates can hardly be overlooked. For the record, however, the Congress appeared pleased with the Arunachal Pradesh results. “The result reasserts the Congress character as an all-India party with a major presence in every nook and cranny of the country,” said Congress spokesperson Abhishek Singhvi. However, the BJP, too, has reason to be pleased with its performance. It has won six seats. It had not secured a single seat in the 1999 assembly poll. Arguments on charges framed against Maj Surinder Singh, facing General Court Martial for reporting fake enemy killings in Siachen, were completed in a military court here today with the prosecution accusing the officer of “gross indiscipline” and claiming that he could have received his gallantry award through similar false reports. Alleging that Army rules had been “misused” to condemn the Major, his counsel R.S. Randhawa yesterday said the charges for alleged fake killings had been framed under Section 63 of the Army rules, the only Section that was not well-defined. A self-taught artist, who explores the soothing power of nature. That is Surjit Singh Barnala, Governor of Andhra Pradesh, whose exhibition of paintings is being held at the State Gallery of Fine Arts in Hyderabad from October 1 to 15. He had no formal training in art, but Barnala had the urge to paint even as a child living in adversity. He started drawing on paper with pencil when he was very young, and the first portrait, a black and white of his grandfather, took shape in 1945. He went on to paint portraits of several national leaders, including Mahatma Gandhi and Tagore, and he had to do with natural lamp soot, as he could not afford to buy colours. His resourcefulness stood the test of time. The natural medium proved its lasting quality, as even after 60 years, his earlier paintings look as fresh as they were on the day they were painted. “I had this inner urge to paint even as a child. Though I started with portraits, inspired as I was by a neighbourhood artist, since then I have been more drawn to nature and mountains in my work,” Barnala told The Tribune. Most of the paintings on display at the State Gallery depict nature in all its pristine glory and splendour. Many of them are drawn by him during his days in jail and during his stint as governor of different states. 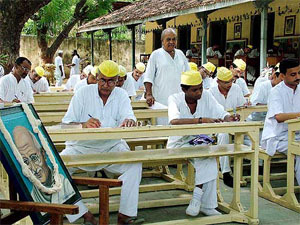 He did about 15 oil paintings during his solitary confinement at Panchamarhi. And as Governor in Madras (1990-91), in Dehra Dun (2000-02), and at present in Hyderabad, he continued to devote time to pursue his passion. “I was at peace with myself in jail and in any case, I got time to indulge in my passion only when I was confined. I worked on 15 paintings during the Emergency period,” he said. According to the curator of the Gallery, Ms Koeli Mukherjee Ghosh, the 42 paintings on display have been appreciated for their sensitivity, artistic expression and the use of the medium. The Governor, who frankly admits that he doesn’t understand the so-called modern art, said he had tried different mediums at different points of time. “When I was in Dehra Dun, I learnt the technique of water work from Phalguni Das Gupta, and in Hyderabad, Aziz, who does works in relief, taught me the three-dimensional art,” he said. According to Mr A Srikanth, Director, Department of Culture, Chief Minister Y.S. Rajaskehara Reddy picked up a landscape for his personal collection for Rs 1 lakh. IFFCO (Indian Farmers Fertiliser Cooperative Limited) took another couple of paintings. The proceeds of this second exhibition — the first was held at Art Gallery of Patiala University — will go for charity work. Congress chief Sonia Gandhi was the target of a joint rally addressed by Shiv Sena chief Bal Thackeray and former Prime Minister Atal Bihari Vajpayee. Both leaders, who had stayed away from the campaign due to ill health, were addressing for the first time on the penultimate day of campaigning. Mr Thackeray used the occasion to hit out at Congress chief Sonia Gandhi. Mr Thackeray criticised the United Progressive Alliance government, saying the Centre had turned a blind eye to the increased influx of illegal Bangladeshi immigrants into Maharashtra in general and Mumbai in particular. Referring to the charges of discrimination against the Maharashtra Government by the previous National Democratic Alliance government, Mr Vajpayee said the coalition had worked for the development of the state. “During our regime, we had given Rs 5,00,000 crore to the state,” he told the gathering. An ailing Mr Vajpayee stumbled in his speech, calling the Bharatiya Janata Party the Bharatiya Jana Sangh while referring to the alliance with the Shiv Sena. He targeted NCP chief Sharad Pawar for joining hands with the Congress despite quitting the party a few years back over its president Sonia Gandhi’s foreign origin. He said agriculture was the backbone of the majority of people in Asia and farmers in the region faced various problems due to seasonal fluctuations. The WTO should protect the rights of the farmers in the developing countries in an equitable and transparent manner, he said. The two-day conference, hosted by the National Cooperative Union of India (NCUI), is organised by JA Zenchu, Central Union of Agricultural Cooperatives in Japan, with representatives from Indonesia, Thailand, Vietnam, Japan, Sri Lanka, Korea, Malaysia and Taiwan. The Centre has released Rs 10 crore for 24 roads to be constructed in Amethi, ahead of Congress leader Rahul Gandhi’s four-day visit to his Lok Sabha constituency beginning tomorrow. Sources in the state security apparatus said Mr Gandhi would reach here tomorrow morning and leave for Amethi where he would stay for four days. This is his fifth visit to Amethi after he won the Lok Sabha elections in May. Disposing of a 1998 petition by Bhopal Gas Peedit Mahila Udyog Sangathan and some other organisations working for the affected people, a Division Bench of the Supreme Court comprising Mr Justice Shivraj V. Patil and Mr Justice B.N. Srikrishna has constituted an advisory committee and a monitoring committee for the purpose. The Director-General of Indian Council of Medical Research (ICMR) will be the chairman of the seven-member advisory committee having eminent doctors on it. The five-member monitoring committee will be headed by Mr O.P. Mehra, a retired IAS officer for Madhya Pradesh. The terms of reference enjoin upon the advisory committee to examine the “treatment practices currently followed by medical personnel in hospitals/clinics run by the government for the Bhopal gas victims for the various ailments suffered by them”. The monitoring committee has been asked to pay particular attention to the quality, adequacy and availability of medicines and other clinical disposables for the hospitals and clinics. Once Harivanshrai Bachchan wrote: “Jab shayar budha hota hai, uski kavita tab naujavan ho jati hai’’ (When a poet becomes old, his poetry grows younger). Today, people say as Amitabh Bachchan grows older, his acting gets better. The skin may have sagged and the body lost its spring, but his matchless baritone and articulate eyes remain the dry gunpowder that explodes at a touch. Though ‘Babu Moshai’ turns 62, his show on screen continues with clinical precision and the 34-year-old professional journey is now on a new high after many ups and downs. Even in celluloid life, the poet father left his imprint on the actor Bachchan through rebellious writings and India saw the screen rebel in Amitabh, who always considered his father “the original rebel’’. When Amitabh, simmering with vengeful anger, burst on the silver screen with ‘Zanjeer’ (1973) and ‘Deewar’ (1975), many of Salman Rushdie’s midnight children seemed to have found a soulmate on the celluloid.